Despite his silence, Edgar proved to be a great companion. As opaque as a rock, he never ceased to be interesting. I’ve always been drawn to quiet people. Wanting to relish everything David Wroblewski has to tell about Edgar, I went through each page very slowly. (I’m currently on page 380.) There were parts I had to stop to give way to my emotions, like when he had pounded his chest to seek help over the phone when his father passed out. I was on the bus when I read this part, so I managed to control my tears. The griefs over his father’s death were too dramatic, I couldn’t get them out of my head. David portrayed his characters strong on the exterior, yet dying within. I wasn’t entertaining the notion that this story must’ve really happened- until I’ve read about Hachiko (by the name, you can say it’s a dog from Japan). It’s a dog known for its loyalty and faithfulness to its owner – even after his death. Didn’t we all think that a dog is simply tamed by anyone who gives it the attention it craved? Even some humans are tamed by just about anyone who gives them the affection they so dearly wanted. But Hachiko is different. The pup deserves a shrine of fidelity. I mean not to spoil your reading, I just can’t help talking out of fascination. Have you read the book? Share your thoughts about it. ‘Just finished reading the book without skipping a page. My Reading professors would surely frown at this bad habit (e.g. reading everything) yet I had no choice, Wroblewski’s plot is impossible to correctly guess. Plus, Edgar is such a character extremely difficult to un-love. Once you begin to unravel the mysteries through the author’s excellent switching of POVs (point of views), you’ll appreciate the motivations that fueled the words & acts of Trudy, Claude, Almondine even the minor character, cop Glen. The first half of the book seems emotionally loaded, the other half, far too thrilling to put down. I must be fond of escapes. Drifting away into the vastness of possibilities ahead, leaving behind the cares & concerns of the usual days found ironically inside the four walls of our own comfort zone. 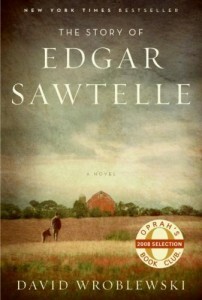 If I feel bad, I usually sleep early then wake up finding myself curling up with Edgar Sawtelle on the couch in the living room, which is luckily always empty at dawn. Though I’m not a dog-lover, I was smitten by Essay’s gallantry, and Almondine’s devotion towards Edgar. A sense of satisfaction cuddled me. A blaze engulfed me the way Nicholas Sparks’s unputdownable Walk to Remember did (my cheeks feel so warm.hihi). Just as well-written, The Story of Edgar Sawtelle is a gripping love affair between an extraordinary boy and remarkable dog/s waiting to enthral you.